Central London office take-up in October 2013 reached just over 900,000 sq ft according to data collected by Cityoffices. It was another good month for the City of London and fringe areas which registered 300,000 sq ft of deals each. Amongst the biggest deals were 74,000 sq ft let to the Sports and Arts Councils at 21 Bloomsbury Street, WC1 and a 54,000 sq ft deal by HSBC Bank at 1 Canada Square, E14. The top rent was £75 paid by Armani on some 17,000 sq ft at the newly completed 5 Howick Place, London, SW1. The recent Jones Lang LaSalle’s Global Corporate Real Estate (CRE) Survey raised some interesting issues on the future of the office workplace and how office tenants plan to use their space in the future. Separate teleresearch by Metropolis over the last year had found that the number one aim of facilities managers is the sub-letting of surplus space, although this has recently seen a shift towards concerns on having enough space for expansion. As a result, a small but increasing number of firms are looking at taking more floors in their existing building. The Deloitte Real Estate London Office Crane Survey Q3 2013 conducted with Cityoffices.net, reveals that central London’s office construction market is at a four-year high with 9.7m sq ft across 71 schemes now under construction. The survey records 28 new starts across the capital in the last 6 months, and 6.6 million sq ft expected to be delivered next year. Over 2m sq ft is already leased to tenants prior to construction completion. 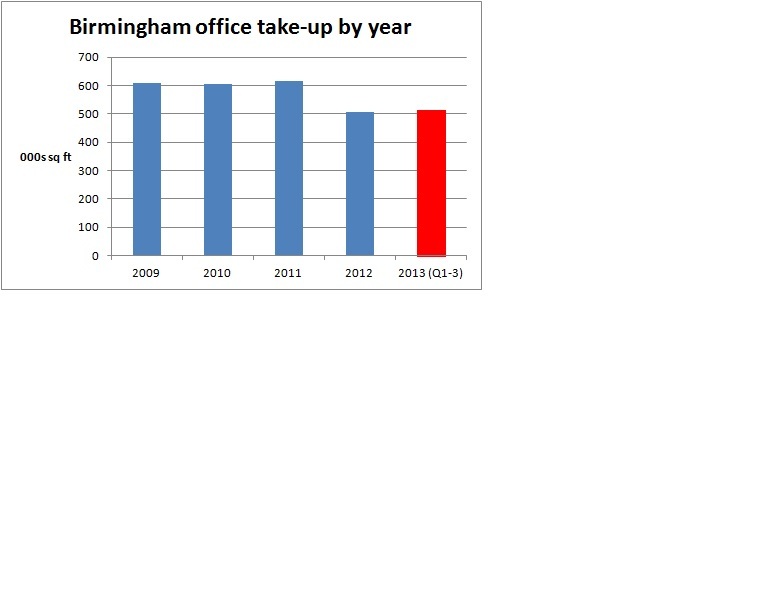 A recent report from property consultant Knight Frank on Birmingham’s office market highlighted a rise in office deals in 2013 which has seen nearly 514,000 sq ft transacted in the city this year, already overtaking Birmingham office take-up for the whole of 2012, with one quarter to go. Looking ahead, Metropolis is monitoring some 25 live office requirements in Birmingham, with a further 40 office tenants making decisions on 2014 lease expiries soon. Some of the tenants may be tempted by new space in the Birmingham pipeline at 158 Edmund Street (150,000 sq ft), 2 Cornwall Street (263,000 sq ft) 45 Stephenson Street (100,000 sq ft), One Trinity Park (50,000 sq ft) and 55 Colmore Row (153,000 sq ft). A recent report by City of London office agent Ingleby Trice highlighted the trend of London office occupiers withdrawing space from the market for their own occupation. During the last five years, many firms looked to sub-let office space that they deemed to be surplus to requirements. This added considerably to the volume of office space available in central London. In some cases this was due to relocation, but in most cases because the tenants were shrinking their office workforce. There are now signs that the wheel is beginning to turn the other way. In recent months Prudential (30,000 sq ft), Barclays (20,000 sq ft), Dealogic (28,000 sq ft) and Willis Insurance (35,000 sq ft) have all withdrawn space from marketing because of re-occupation requirements. Metropolis’ research team have also spoken to over a dozen large firms which have decided to expand in-situ over summer 2013, choosing to take extra floors rather than wholesale relocation. Many more are mulling this option for 2014. The trend is important for those in the refurbishment sector, as space previously on the market, can be neglected and at the time of a decision to re-occupy may need extensive remedial work to bring it back up to corporate standard. Metropolis expect this phase of the market to last up to two years and could result in a substantial volume of space, currently vacant, being re-occupied.